Lego is one of the most enduringly popular toys on the planet and like all good toys the concept is very simple. The little plastic bricks which can be pushed together in an infinite number of different ways and can be made into all sorts of buildings and objects. Lego are one of the best-selling toy items in the world and the Lego brand has diversified into video games, theme parks and much more. Lego is a Danish company, which still has its worldwide headquarters in the small town of Billund. The company was created by a Danish carpenter who started off by making small blocks out of wood for children to play with, and started using plastic in 1947. The brand name comes from the Danish phrase “leg godt” which means playing well. The materials used to make the bricks varied over the 1940s and 1950s as the company tried to get the most durable bricks possible, and hit on the perfect formula in 1958. The design for Lego bricks has changed very little since. The Lego brand has had huge success in associating itself with other relevant brands and themes. There are links with Harry Potter, Star Wars and Batman, which means that kids can not only buy Lego sets based on the popular movies they see in the cinema, but can also play the Lego video games and wear the Lego Batman t-shirt or pyjamas. Links with Kickers have created a hugely successful of brightly coloured Kickers boots for children, branded with the Lego logo or images of Lego figures. The original Legoland in Denmark opened in 1968 and there are now other parks in Windsor near London, Germany, California and the newest addition is in the theme park capital of the world, Florida. Future plans for expansion include parks in Japan, Korea and Malaysia. The family-friendly atmosphere of the park, with child sized rides and recreations of famous landmarks from around the world has made Legoland one of the favourite days out for children of all ages. Lego is not just for kids, and adults love playing with the bricks too. Lego have recognised this fact and have developed a consultancy business, which goes into companies and helps them get staff thinking creatively using Lego blocks to build their ideas and convert them into reality. 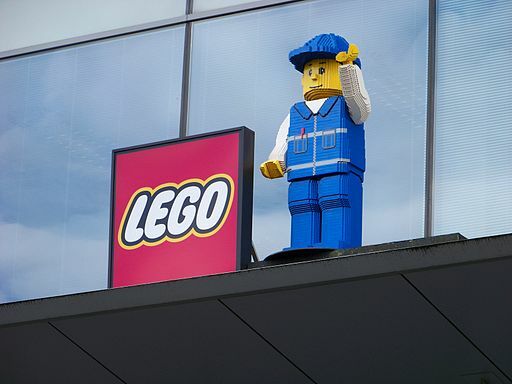 Although this business is quite a departure from Lego’s key business, it is proving successful with companies of all different types and sizes. One of the most recent additions to the Lego family is a range of small scale board games, some of which are based around the Lego licensing agreements with partners such as the makers of Harry Potter or Batman. Board games have the dual purpose of allowing the children to first construct the game using the Lego pieces and then play the game on the board. Games are priced competitively and are suitable for children to play alone or with other members of the family. For a great selection of Kickers shoes for women (not Lego ones I'm afraid!) then head over to Peppermint, a fabulous online fashion retailer.